It's great when generations get together to pass down family traditions, especially if the little ones might need a little extra time to get on board. 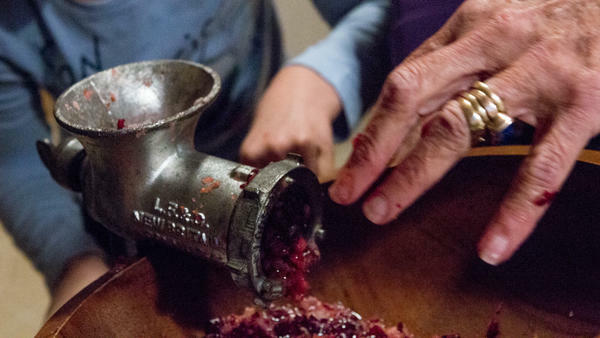 Sure, a modern fancy food processor might get the job done with more flourish, but there is absolutely nothing wrong with a good old-fashioned meat grinder. I thought it was delicious, made it every year at Thanksgiving, and because I like tradition, wanted to give listeners a tradition of their own. I always warn them that it's a recipe that sounds awful (whoever heard of putting onion and horseradish in with cranberries? ), but tastes terrific. And it does! Trust me. Each year, it's been a challenge to find a new way of presenting the recipe on the air. One year, a rap artist helped me talk about it. Another year, Martha Stewart — just out of jail – gave it her seal of approval, and another year I found a way to insinuate it into the Monica Lewinsky-Bill Clinton scandal. This year, I made "tradition" the theme. At home every year my son and I make it together. This year, his 8-year-old daughter, Vivian, got into the act — with mixed results. When we were finished grinding and mixing, she tried it. Her verdict: "I'm never tasting it again." Hoping you'll be more adventurous. The relish has a tangy taste that cuts through and perks up the turkey and gravy. It's also good on next-day turkey sandwiches, and with roast beef. All right, it is that time of year. On the Friday before Thanksgiving, for the last 46 years, NPR's special correspondent Susan Stamberg has shared with listeners a family recipe. She says it sounds terrible but tastes terrific. And you should be the judge. 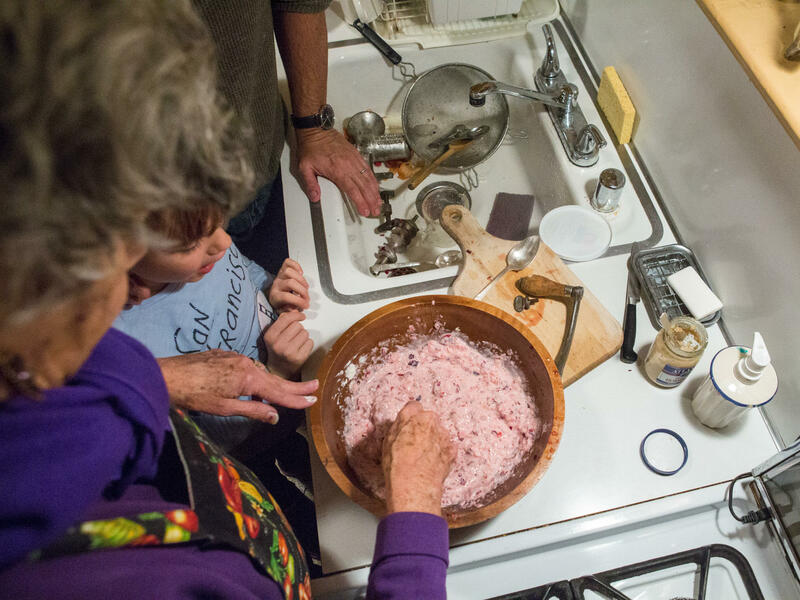 Here comes Mama Stamberg's cranberry relish. SUSAN STAMBERG, BYLINE: What can I say? I believe in tradition. I also believe in my late mother-in-law's recipe - tart, tangy, icy and, yes, the color of Pepto-Bismol. It's a lovely, shocking pink. Each year, I'm hard-pressed to come up with a new way to present it. This time, I got help from Justine Kenin, a producer on All Things Considered. JUSTINE KENIN, BYLINE: So Susan, have you and Josh ever made it together? S. STAMBERG: Josh is my son - Josh Stamberg, the actor. KENIN: Have you and Josh and his daughter ever made it together? Surely, it's time for your granddaughter to know how to make it. S. STAMBERG: So you can blame Justine for what follows. JOSH STAMBERG: Come on, river tooney. Come on. VIVIAN STAMBERG: I just saw a (unintelligible). S. STAMBERG: Vivian Stamberg was 8 when we recorded this right before Thanksgiving last year. She was just dying to get started. J. STAMBERG: Come on, Viv. S. STAMBERG: She moseyed into the kitchen. We were gathering equipment. We got to get out the meat grinder. J. STAMBERG: Anything that you see down there from 1910 or earlier, we need. That's it. Perfect. S. STAMBERG: Continuing a tradition her dad created at her age, Viv opens the back door and makes an announcement to the backyard. VIVIAN: (Yelling) We're making the cranberries. S. STAMBERG: The ingredients are laid out. Raw cranberries - you wash them first - a small onion. Put them into the funnel on top of the meat grinder. I have never owned a food processor. Grind the onion and the berries together by cranking the big handle. S. STAMBERG: It's not working. Instead of a chunky onion and berry pulp, all that comes out is bright red juice - cranberry and onion juice. Vivian insists on tasting it. S. STAMBERG: Usually, she likes ice cream. We struggle with the grinder. It's not grinding. Blade must be wrong. VIVIAN: (Yelling) We had a problem with the cranberries. S. STAMBERG: Blade flipped, the grind begins. J. STAMBERG: OK. That's good. S. STAMBERG: Ow, wait - my thumb (laughter). You cut my pinky. J. STAMBERG: Wow. That looks really old, that horseradish. How old is that? S. STAMBERG: Two tablespoons of horseradish. S. STAMBERG: I mean, how much call is there for horseradish in the course of a year? You stir it all together. VIVIAN: I'm kind of scared to taste it. J. STAMBERG: Here we go. Ready, Viv? S. STAMBERG: (Laughter) Many people feel that way, Viv. S. STAMBERG: But he thinks it's too sweet. We put in more horseradish. J. STAMBERG: Still too sweet. S. STAMBERG: Oh, it is so sweet. Needs more. You'll do it? More horseradish. And more. Pretty much, the whole jar is in by now. The color's right - nice consistency, chunks of berries and onions. But it's not tangy. No bite. Someone - me - leaves, buys a new jar of horseradish, mixes in a fresh tablespoon or two. Voila. Just right. Josh and I are relieved, but it's not unanimous. VIVIAN: I am never tasting that again. S. STAMBERG: She helps, though - puts it in a container to freeze it. On Thanksgiving morning, I'll move it from the freezer to the refrigerator to thaw. S. STAMBERG: Culinary tasks completed, Miss Vivian Stamberg tries a different art form. S. STAMBERG: And thus, the grinder has been passed to a new generation. Next year, her little sister Lena may get into the act.